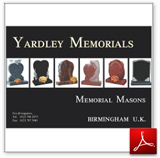 Yardley Memorials offers a personal, sympathetic and professional service when you are faced with the painful and emotional task of choosing a suitable memorial for a loved one. We offer also renovate memorials that have fallen into disrepair. Below are a few examples of our work.